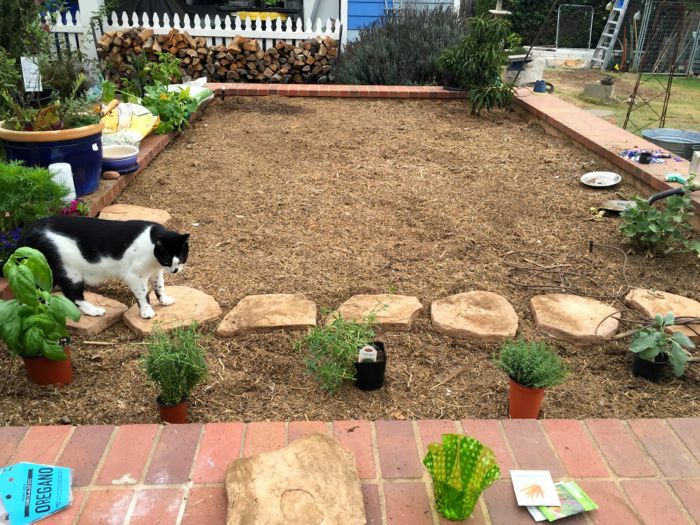 This big, beautiful bed was cleared out, the soil turned, and amended from the goat-chicken team compost... all of that intense labor thanks to a wonderful handyman. It's ready to be planted, and has been waiting for me to be ready, too. It's a gift, a prize, a playground for the hands and soul. I've been immersed in the pleasure of digging, hauling, and planting for the last two and half hours... talking to the peppers and cosmos, tucking in the herbs, reassuring the zinnias. I met worms, thank goodness! Bees are already visiting the rosy Sweet William. Alex joined me for a spell, and I know Maria will be glad to plant the carrot seeds. The work is nearly complete. No, actually, it's only the beginning! I only hope that what's begun will flourish and delight. A good garden, it seems to me, is a blessed mix of labor, optimism, and nature's favor. God bless gardeners!